Looking for a way to help a homeless dog? 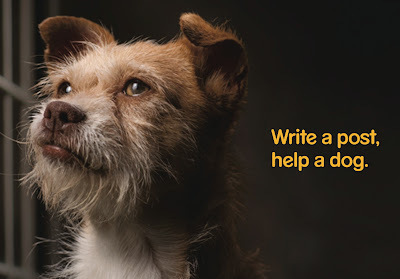 If you have a blog of any kind, simply write a post to help a dog from now through September 19 and Pedigree will donate a 20-pound bag of food to an animal shelter. Just include the bullets listed here, and add the direct link to your blog post to our Blog Hop below so we can all see how big an impact we are making! This year the PEDIGREE Adoption Drive is raising awareness for homeless dogs by donating a bowl of food to shelter dogs for everyone who becomes a "Fan" or "Likes" the PEDIGREE Adoption Drive on Facebook. So far more than 1 million bowls have been donated. Special for BlogPaws West: For each blog that posts about the PEDIGREE Adoption Drive through September 19, PEDIGREE will donate a bag of its new Healthy Longevity Food for Dogs to shelters nationwide. 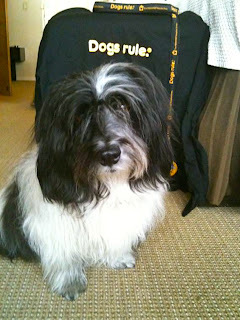 It's simple: Write a post, help a dog. Thursday, September 16 through Sunday, September 19, the Pedigree BlogPaws bloggers will host a Blog Hop to help raise awareness for the "Write a post, help a dog" effort. Tell as many of your blogger friends as you can, so we can help even more dogs. And if you don't have a blog, please tweet about this using the hashtag #dogsrule, re-tweet this post, or share on Facebook to help spread the word even further! Let's see how many bags we can collect! This is such a great idea and an easy-peasy way to help! Thanks for the hashtag. We're gonna go use it! High PAWS for you guys coming up with this great idea at Blog Paws West! More than 100 posts since yesterday even! I cannot believe so many participated! This is amazing! Dogs,Cats, all things God Created! Mans best friend! This is a great cause to help with food! !